Pullman Scholar Alumna Bethsaida Arroyo Forges Her Own Path. All things considered, it would have been easy for Bethsaida Arroyo not to attend college. Her grandparents didn’t make it through grade school, and her mom earned her GED only after Betsy was in 6th grade. That was Andersen Elementary, the neighborhood school at Honore and Division streets which is now LaSalle II, a magnet school. Arroyo sailed through Wells’ first honors program—straight A’s, class president, valedictorian, National Honor Society, Local School Council student representative, published poet, etc.—while all the while working part time at Bed Bath & Beyond. Arroyo’s older sister nailed the school experience as well, getting a full ride to Bates College in Maine. The pair always thought they’d become lawyers. 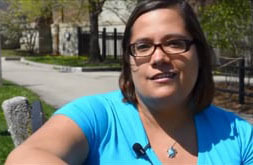 She enrolled at DePaul University in 2004 with a plan to go law school afterward. She brought to college the same qualities that made her such a success in high school–a natural intelligence, an interest in learning, a competitive instinct to be the best. But DePaul required something that Wells didn’t: tuition. “There’s no way I could have afforded it without scholarships,” said Arroyo. “And of all the scholarships, the award from the George M. Pullman Educational Foundation helped the most.” Why? Because it was every year for all four years of her undergraduate work. Like many of her peers who have the smarts and skills to excel at college but don’t have the money to pay for it, Arroyo cobbled together a handful of scholarships, financial aid from DePaul, and a part-time job to cover all the costs. And her career as an attorney? After working for two weeks as a case assistant at a Loop law firm, she concluded the law wasn’t for her. “I thought it would be a great opportunity to get my feet wet and to save money for law school,” she said. But the cases she worked on, at the height of the foreclosure crisis, typically involved “taking homes away from individuals.” She dreaded going to work. Instead, Arroyo returned to the insurance agency where she’d worked while attending DePaul and later was hired as a case manager at Pilsen Inn, a 26-bed, 24-hour supervised residential facility for homeless people diagnosed with mental illness. She’s been there for the last five years and is in a comfortable groove. Her sister, meanwhile, completed her law degree and is working for a Boston law firm. Her mother, after getting her GED, began volunteering at Wells High School and eventually moved into a full-time job there. She’s now the registrar at Kelvin Park High School on the Northwest Side. Education, says Arroyo, has become a guiding principal for her entire family. And the value of her Pullman Foundation Scholarship?